Gazebos, Arbours, Pergolas, Hexagonal and Octagonal Summerhouses – The Prettier Siblings of the Four-Sided Summerhouse? Well, as the function of some of those, as for example arbours or pergolas are so much different from a classical summerhouse, it might be wrong to call them “siblings” even though they are all meant to provide some place to rest in the garden and mostly they are made from wood. So you might call them that. But are they really prettier? Well many wooden garden buildings are pretty pretty these days. If you take hexagonal summerhouses or octagonal summerhouses for example, these buildings often feature lots of glazing, a bright inside and a picturesque look which often really reminds you of a gazebo, only that it is closed to the outside and gives a bit more shelter from the weather than a gazebo, where the air can blow through, which may be very pleasing on hot summer evenings but not so much any more in early spring or fall. So while a gazebo gives you a perfect shelter from the midday sun, a octagonal summerhouse will do the same plus some more. Obviously hexagonal and octagonal style summerhouses are designed to stand out from the more traditional four- sided summerhouses. There are even hexagonal or octagonal summerhouses that look more like a “normal” summerhouse, with less decoration and more contemporary and functional styles, with smaller windows, which are very well suitable for easy DIY insulation, heating and all-year-round use. As well as their smaller siblings, so hexagonal and octagonal summerhouses just simply do look good. Tucked away at the end of your lawn, they provide a picturesque focal point as well as an opportunity to take a comfortable rest for you to sit and admire the beauty of your garden. With roofs in the form of a six- or eight sided pyramid in various optional roofing materials and with lots of glazing, they create a magnificent statement to any space and their attractive design blends well within any garden. Double glazing can allow for heating and use around the year. Some hexagonal or octagonal summerhouses as grillkotas or a BBQ huts even come with a grill-oven. These are usually provided with a chimney hood and thus the grill functions as an effective heating facility. Doors with locks keep the access to your summerhouse under your control and your belongings that you might store there safe. No need to worry, when winds carry the rain sideways. 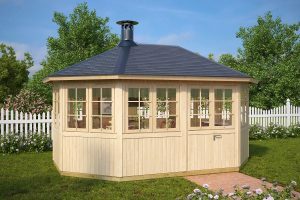 Your belongings in the octagonal or hexagonal summerhouse are as safe from the weather as in any four-sided summerhouse. 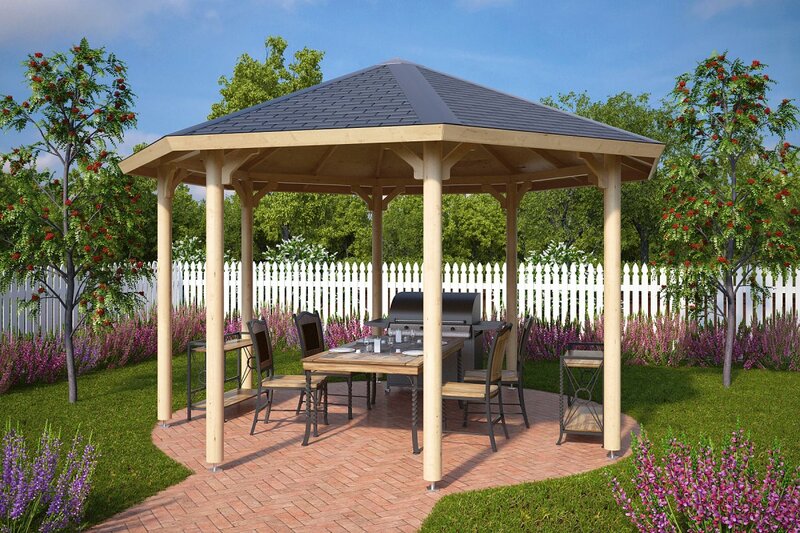 We will also mention some advantages of gazebos, pergolas, arbours over hexagonal or octagonal summerhouses. 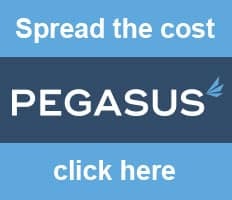 So of course the advantages mentioned above are provided by materials and facilities, so the costs will mirror that and also the amount of space needed for one of the smaller buildings might play a role in smaller gardens or at places in your garden, where smaller dimensions of a wooden garden building are more welcome to create a harmony and the right relation between the specific area and the size of the building. Moreover these buildings are made to use during the summer, when you want to enjoy the fresh air outdoors in your garden rather than sitting behind closed doors again. What makes wooden garden gazebos, arbours and pergolas so special? When talking about gazebos, arbours and pergolas in your garden, we are really talking about beauty, aren’t we? The functional aspect surely plays a role, but the main purpose and the most joy we get just from the looks of it, and from the recognition how much these wooden garden buildings shape the design of our gardens. They are design objects with an additional function and you are the one to choose the building and how to integrate it into your garden setting in so many ways that in the end something very special, individually shaped for just your garden will be the result. You will choose the form of the roof, the roofing materials, the ornamentations, the trimmings, the design of the lattice work. the style of the balustrades and which plants you will have climbing over them. You will choose the colour of the arbour, gazebo or pergola and how it will harmonize with the colour of the flowers around it, build the way to its entrance and decide which side it will open to, the background, the setting, materials to use around it and the style of the garden benches next to it. All of this will make your gazebo, your arbour or pergola a piece of art, creating a personal statement of the artist. Of course their function will also make them a hub for many activities, be it a private or even intimate talk sitting next to a loved one in a beautiful arbour or outdoor dining with friends in a circle around the central round table in your gazebo or under a pergola which may be overgrown by climbers or be equipped with a retractable fabric roof to make you independent from any sudden changes in the weather. Having planned a nice meeting for afternoon tea with friends or family, a gazebo as well as a pergola with a retractable fabric roof will ensure that you hold all the cards when it comes to gambling with the weather. Flat roofs and mono-pitched roofs or rather a kind of open flat rafter structure for pergolas, are quite common for all kinds of garden buildings, One reason is probably that the need for material and therefore costs are minimized with this kind of roof. Looking from the ground, the roof kind of disappears as an element of design and gives the buildings a more contemporary modern look. Facings from wood, metal or shingles surrounding the roof are elements of the design. However, if you happen to look down on a flat roof from your room in one of the upper floors of a neighbouring building, chances are, that it does not look especially beautiful. A flat area of dark-grey bitumen for example isn’t exactly what we would call a picturesque view. So if you want your wooden garden building a marvel of old fashioned beauty in your garden, you will probably choose another roof shape. The next rank in popularity in roof shapes goes to the gabled roof which is quite common with four-sided summerhouses and gazebos. 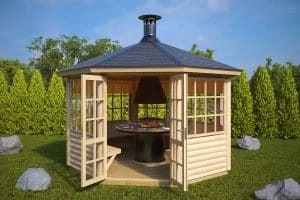 Hipped roofs look a bit more attractive and stylish, but are more often reserved for larger buildings, and wooden garden gazebos often feature a pyramid roof. One of the prettiest roof shapes often come with octagonal or hexagonal summerhouses with roofs in the form of a six- or eight-sided pyramid. These are usually the roof shapes of choice if you aim for a romantic and picturesque look of your garden building. Add shingles or tiles as roofing material and the stunning look will be accomplished. Just cheap bitumen shingles will do the trick, while slate or roof tiles are even more magnificent. 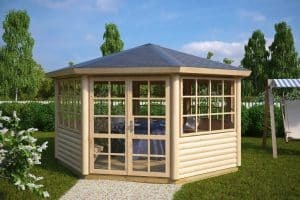 Whatever kind of wooden garden building you are most fond of: If you are after a full range of functions as shelter and security as well as heating and insulation for all-year-round use, then a octagonal or hexagonal summerhouse will combine all these functions with a beautiful look and lots of options to individualize it and fit its design to the settings of your garden.